I was lucky enough to spend two summers singing in Italy while I was in college and as you can imagine I ate a lot of pasta. Although it made me sick at times, I absolutely loved it. The sauces tasted nothing like what I was used to back home and the pizza wasn’t like any pizza I had ever had, there was a freshness to it all that I had never experienced in the United States of Sysco. Upon my return to the US I craved those fresh flavors and wasn’t able to find them. As you would imagine, I was very upset 5 year old. I wanted my spaghetti with pomodoro sauce damn it! Thankfully my mom had locked me in my room at the first sign of a tantrum when I was little, so I didn’t throw the tantrum most Americans throw upon returning to the US. I did however, decide to figure out how to make the sauce I craved. 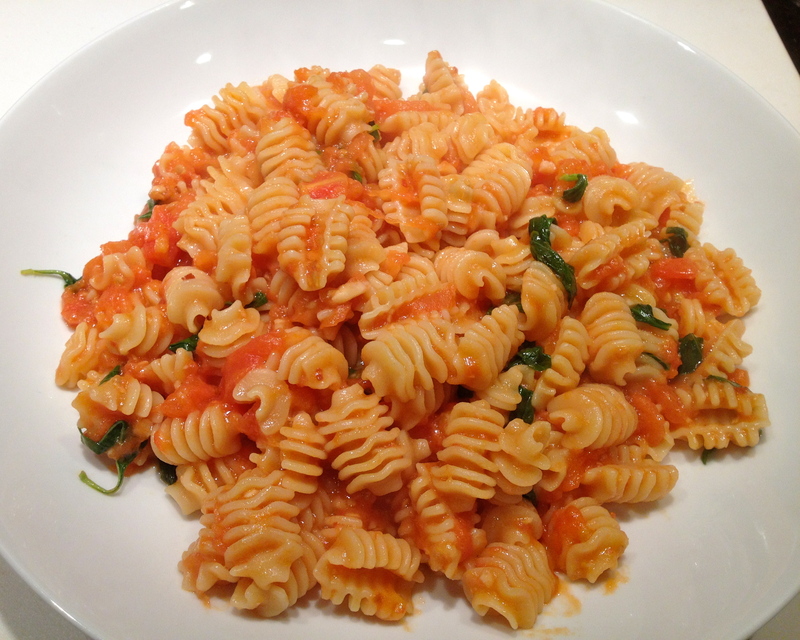 It took some time and cost a lot of tomatoes their lives, but in the end I persevered and came to this recipe! Over a decade after my return I am sharing the recipe with you. Sadly, I can’t get the same amazing tomatoes they have in Italy and the ones in the can are not a suitable substitute for this sauce, not even the imported kind. Tomatoes that are in a can have been cooked as a means to preserve them and as such don’t have the freshness required for a fresh pomodoro. However, if you are ever lucky enough to grow your own tomatoes and have a surplus at the end of the season this is a perfect sauce for it. You also should call me, cuz I need more friends like you. 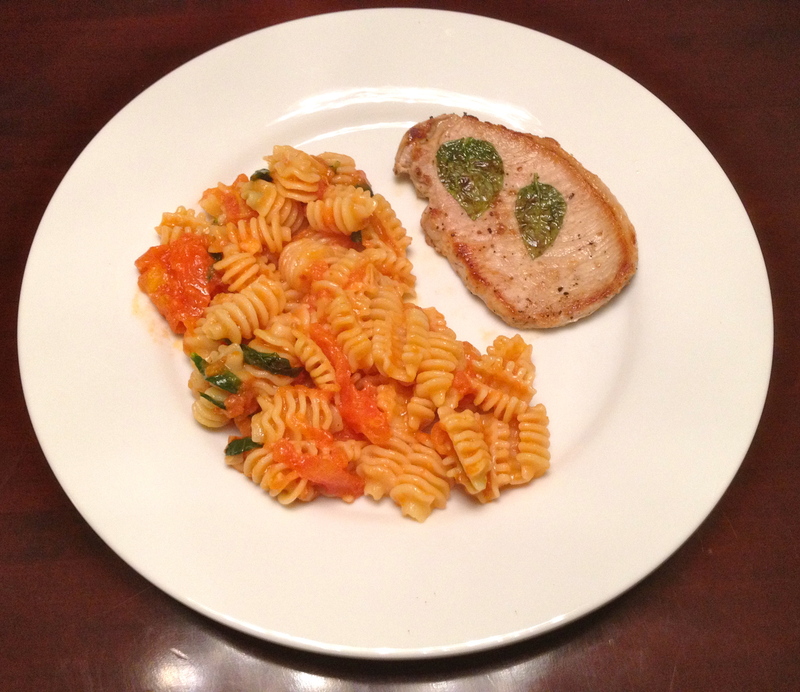 Given the fresh simplicity of the pomodoro sauce I decided to serve it with pork chops simply seasoned and garnished with basil leaves. This dish is meant to serve 4 but if you are feeding big eaters it will only go for two. A note on timing: This is a relatively simple meal to make and takes well under 30 minutes to cook once the tomatoes are peeled. That said, if you want to get the meal to the table hot the timing is essential. Here is the timing/steps I recommend. Peel and crush the tomatoes, assemble the pork chops, place pasta pot to boil, begin frying the pork chops, add pasta to the water once it starts boiling, begin sauce, keep checking on the pork and move to serving tray when cooked, two minutes before the pasta is perfect add the basil, a minute before the pasta is perfect add it to the sauce and allow it to finish cooking in the pasta sauce adding reserved pasta water as needed. This should make the meat perfectly rested and ready to serve just as the pasta is finished cooking. 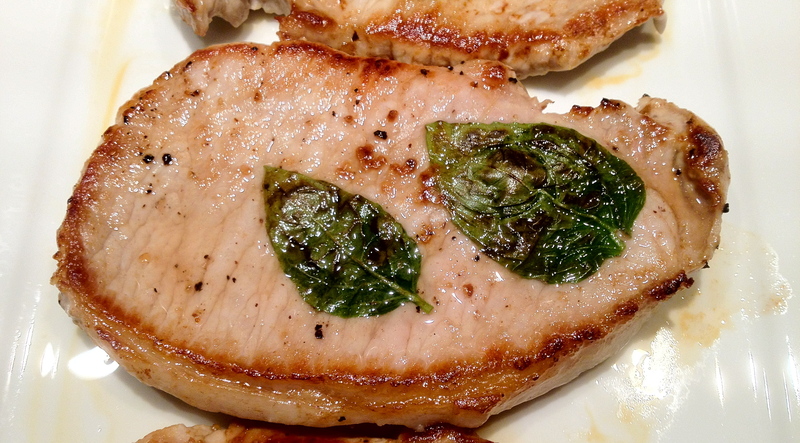 If you are using thick pork chops you will want to start them before you place the pasta water to boil. Place a pot of water over high heat. 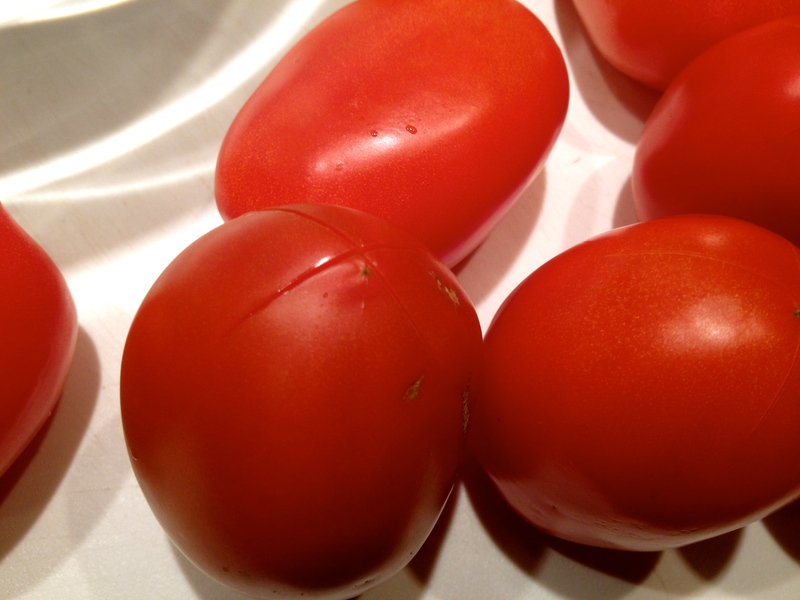 While the water is comming to a boil score the tomatoes with a cross on the bottom, this will help them peel easier. 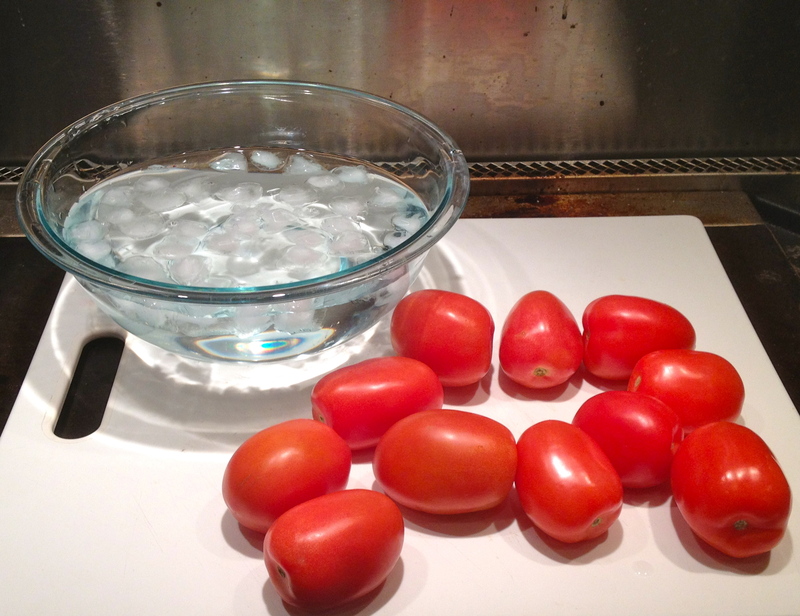 Fill a bowl with cold water and ice and set near your pot. 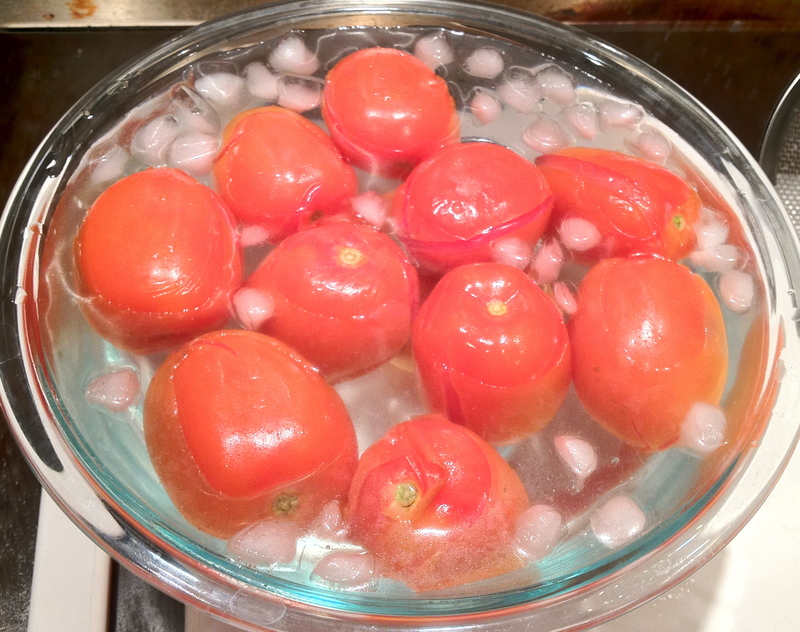 Tomatoes in boiling water. You can see how the skins have started to split the length of the tomato. 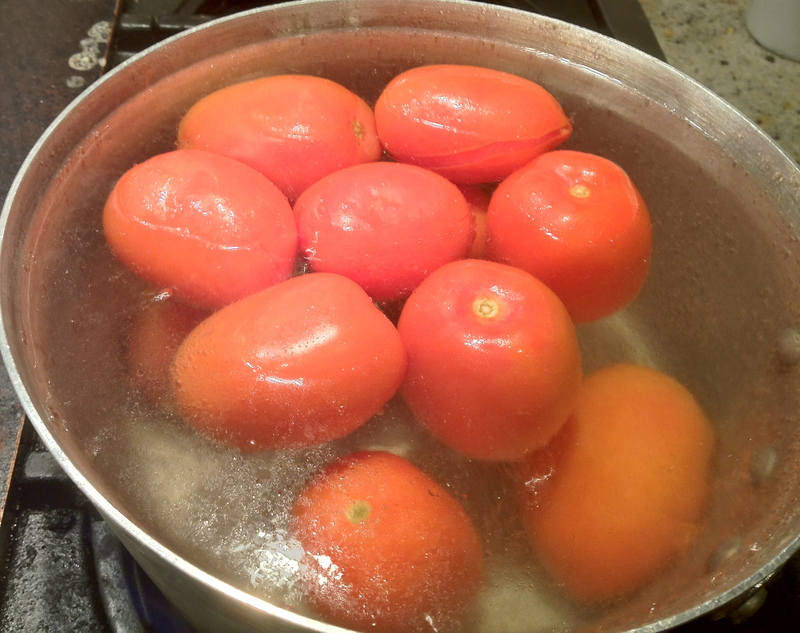 Once the water has come to a boil, place the tomatoes in the water and allow to boil for 10-30 seconds, or until you can see the skin split and peel. Next, transfer to the ice water and allow to cool. This is not only so that you can handle them without burning yourself, but it actually helps the peels come off more easily. Let sit for 30-40 seconds. 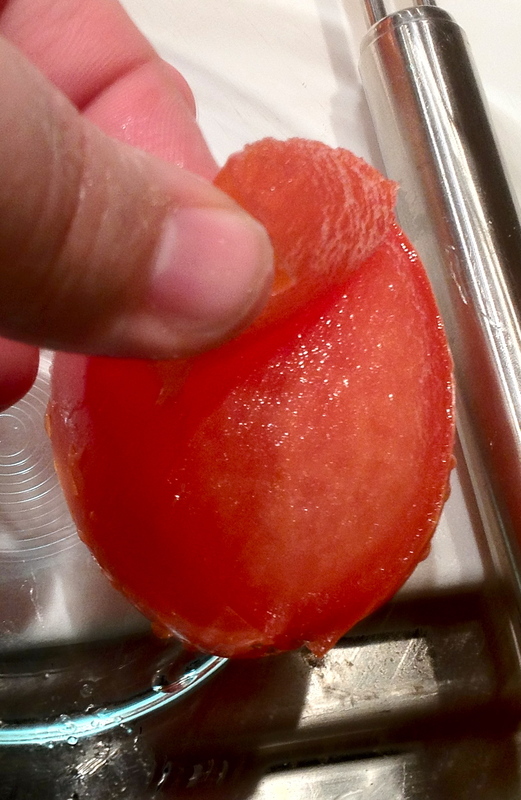 Then, carefully pick up the tomatoes and peel the skin back, it should come of easily but every now and then you get a stubborn tomato and you need to show it whose boss with a paring knife. 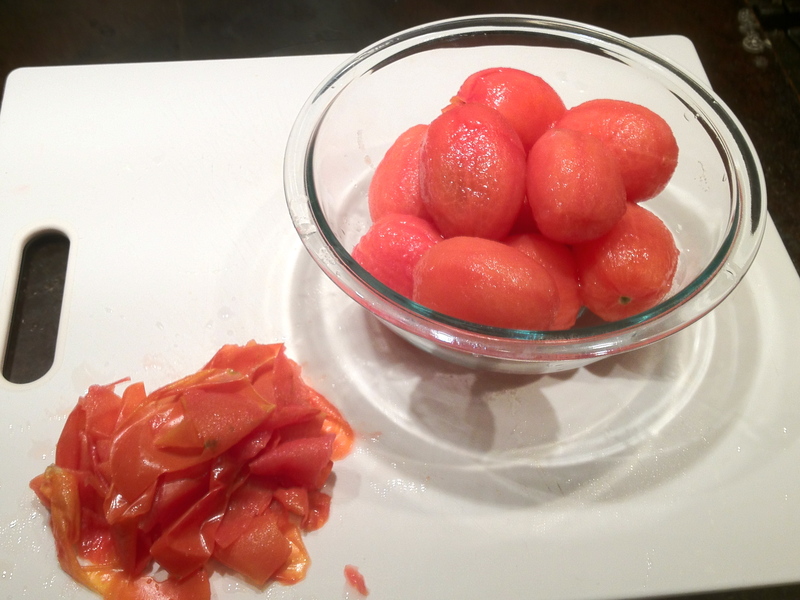 Once all the tomatoes are peeled you can slice them in half and remove the seeds if you like. I prefer not to do this because I don’t find that the seeds really add a negative flavor and I enjoy the flavor the tomato water brings to the sauce. However, if you don’t like the seeds, scrape them out. 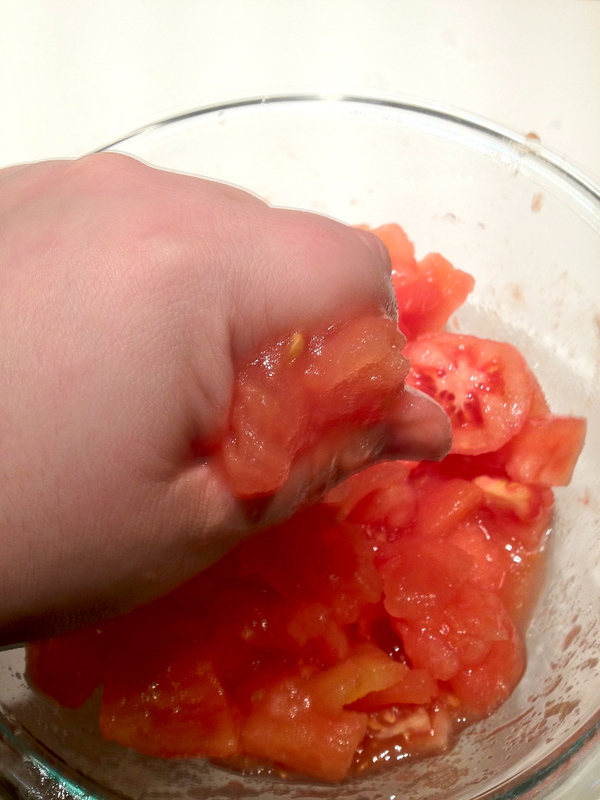 Then, either dice or crush the tomatoes with your hands. I like crushing them as it reminds me of the “brains” bowl on halloween when you were a kid, and I also just like playing with my food and getting dirty. Bring water to boil in a pot and add the pasta noodles. 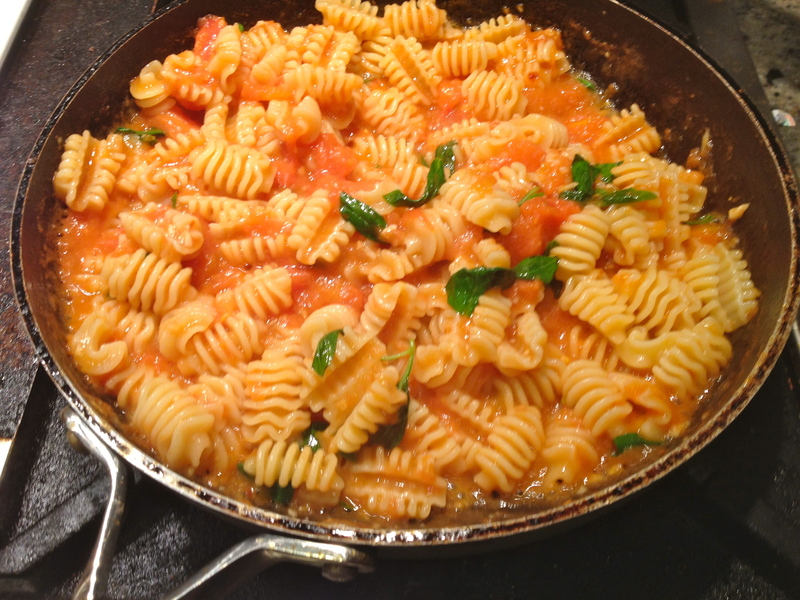 The pasta should cook for 1 minute less than necessary in the boiling water. This means that if your package states to cook it for 8 minutes, cook it for 7. 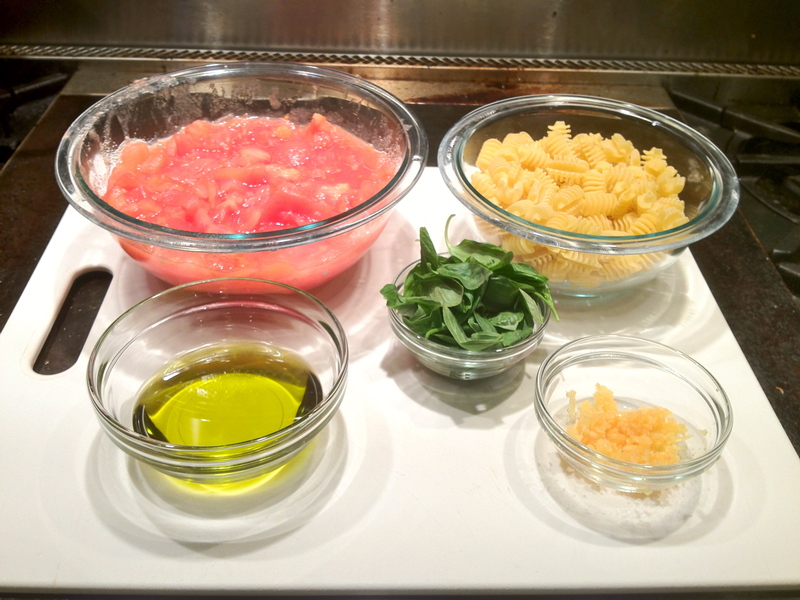 Strain the pasta, reserving some of the pasta water, and add it to the sauce. 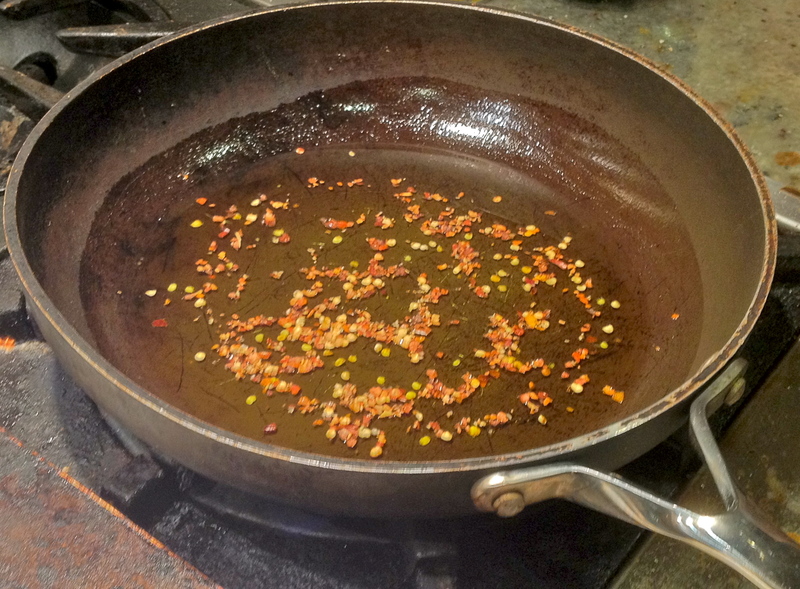 Place a skillet over high heat, add the olive oil and the red pepper flakes. 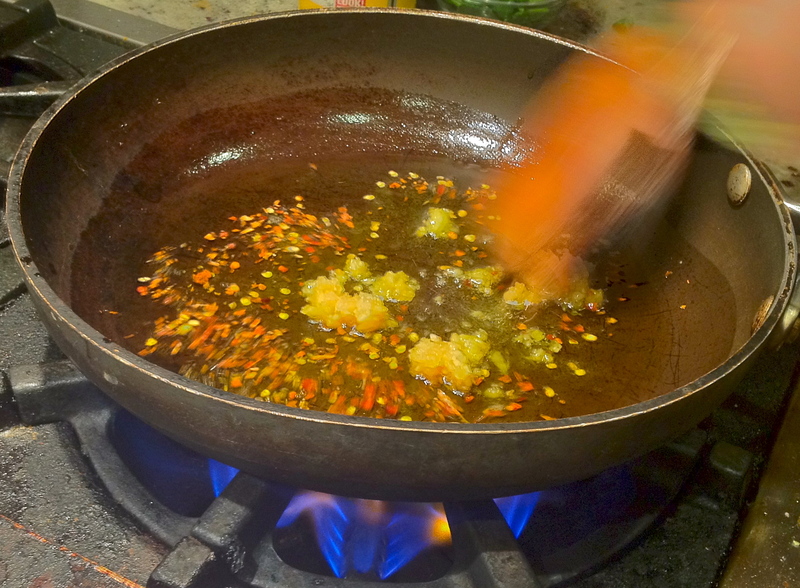 Toast/fry the pepper flakes until they are aromatic being careful to not let them get black. About 15-20 seconds. 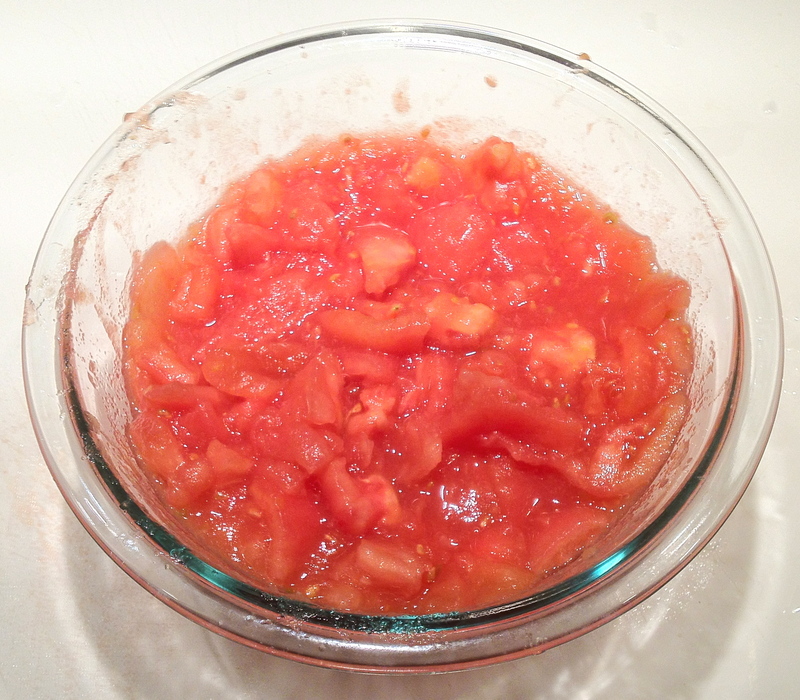 Quickly add the garlic, stir once or twice, letting cook for no more than a 10 seconds and then add the tomatoes. 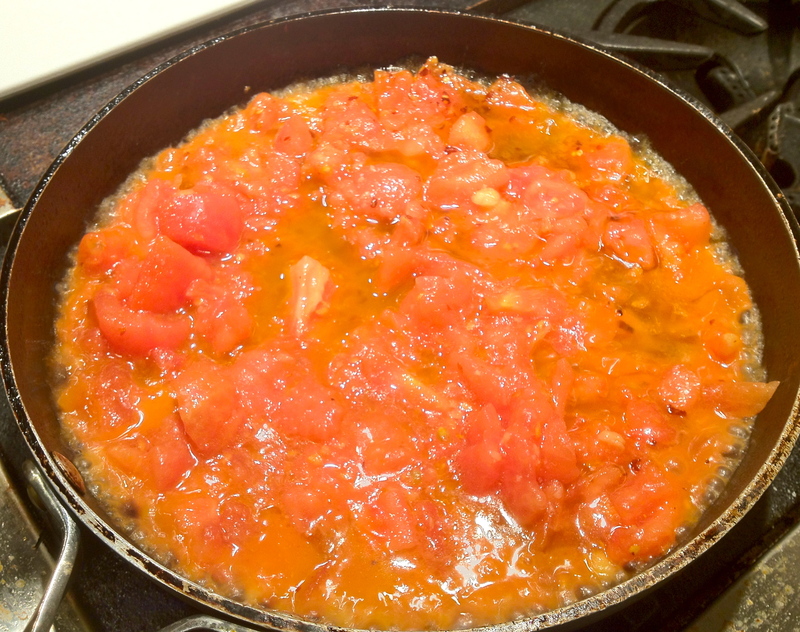 Tomatoes boiling rapidly upon hitting the pan. Let the tomatoes cook down. 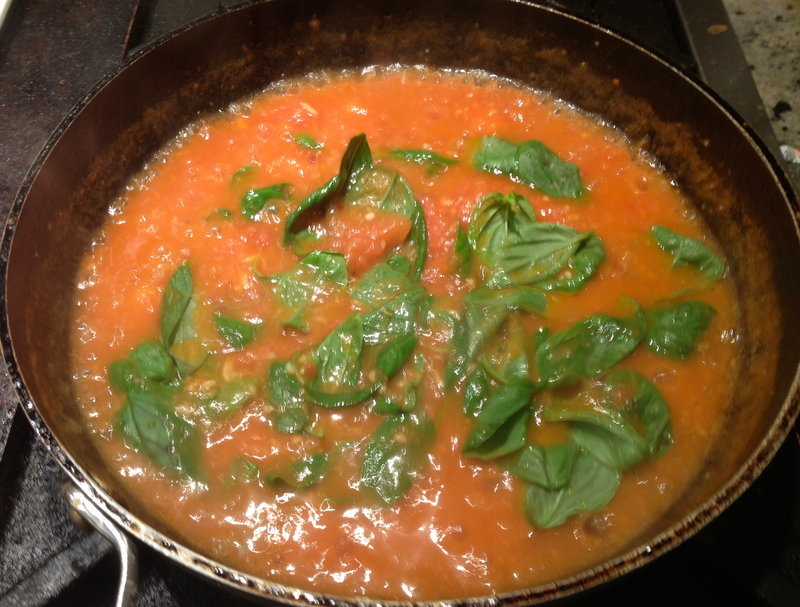 Then, 1 minutes before you are going to add the pasta add the basil. Once the pasta is a minute away from doneness strain it, reserving some of the pasta water and add the pasta to the sauce, stir together and allow the pasta to finish cooking in the sauce. If it gets too dry add some of the reserved pasta water. Season the pork with salt and pepper on both sides. 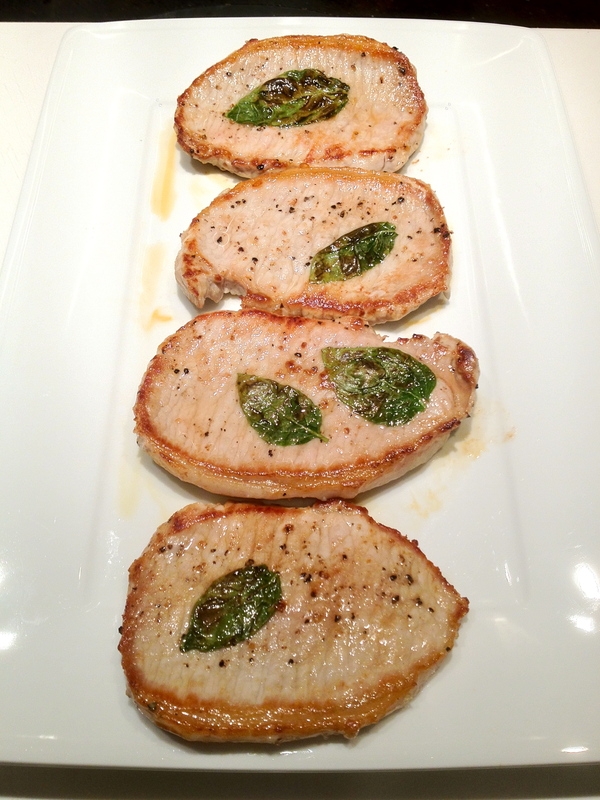 Next take the basil leaves and apply to the pork. You will see when you hold the leaf that there is a dull side and a shiny side. The trick is to apply the shiny side to the pork. That way it will stick without any “glue”. 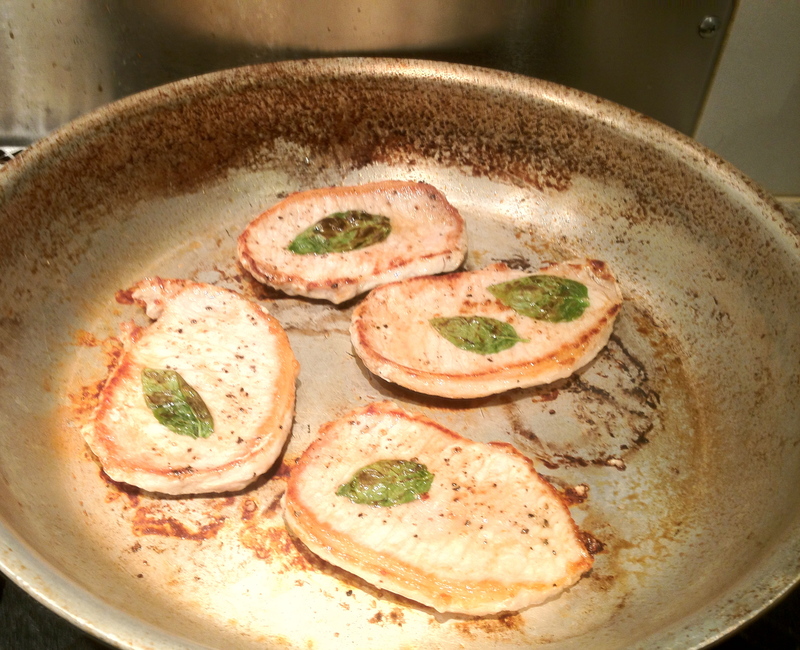 Fry the pork chops in a hot pan with a little cooking spray. Begin cooking them with the basil side down. Allow them to cook for 3-5 minutes or until they have achieved a nice golden crust. Flip and reduce the heat to medium low and cook until the pork has reached the desired internal temperature. It is important to let these rest before you eat them. The timing I have given above should give you enough time to rest the pork but if your chops are larger than mine and take more time, do not skip the resting phase. 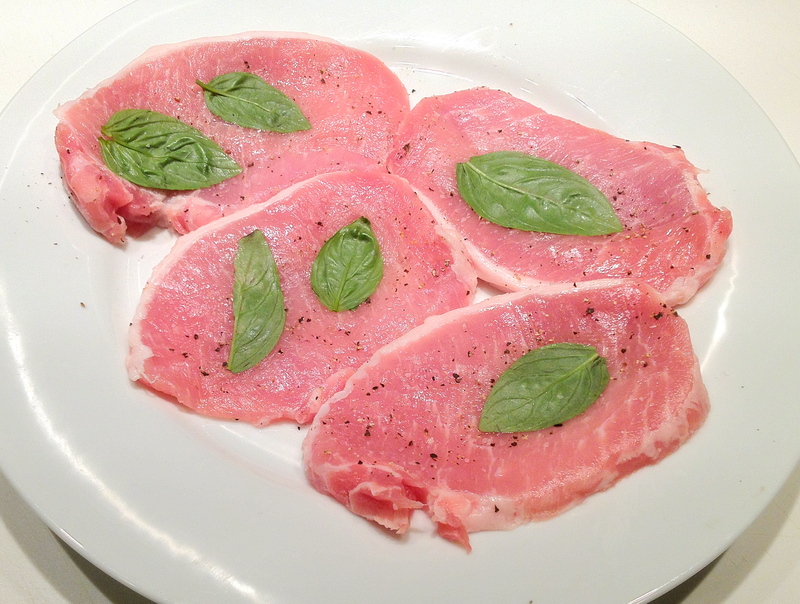 Pork can be very dry and I find that it benefits more from a rest than even a steak will. So… rest your pork, OR I WILL KILL YOU!! All that’s left to do now is to serve with a good parmesan cheese and apply to face. Oh wow. A simple, yet fresh and delicious meal. Looks great.